processing and 45 second Super Rapid processing. 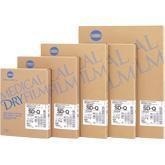 MG-SR Type MG-SR is an orthochromatic film with medium contrast, suitable for general radiography, covering a complete range of diagnostic exams where maximum flexibility is desirable. MGX-SR Type MGX-SR is a very high contrast orthochromatic film, suitable for extremities and special procedures, as well as other exams where maximum contrast is desirable. MGL-SR Type MGL-SR is a high-resolution film suitable for abdominal radiography and other general radiographic procedures where wide latitude is desirable. MGT-SR Type MGT-SR is an orthochromatic chest film designed for enhanced diagnostic information at low densities. MGV-SR Type MGV-SR is a high-speed medium contrast film that provides high quality images for all general radiography applications. The speed of Type MGV-SR is very useful in portable, trauma, pediatric applications and special procedures. Special new anti-halation technology increases image sharpness. Designed for linear gradations from low-through high-density areas, SD-P/SD-PC delivers excellent diagnostic clarity in the processed image. Daylight packaging makes the film easy to handle. (Film is available in the following sized, 14×17 inch (35x43cm), 14x14 inch (35x35cm), 11x14 inch, 125 sheets per box.) The film is available in a vivid blue or clear base type, to allow selection of the appropriate film for the application. In a field where developing precise x-ray images, in as short amount of time as possible, leads directly to improved patient care, Konica Minolta film products truly lead the way in the patient care revolution. Specially designed with maximum diagnostic clarity and strong resistance to scratches and abrasions, our films add to our reputation for ease and reliability in diagnostic procedures. 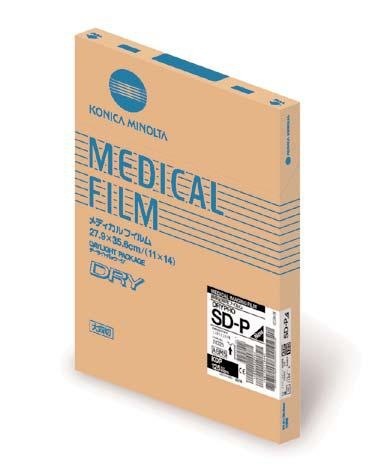 Konica Minolta's extensive specialty line include Mammography film, Duplicating film, Video Imaging film, Spot film, and Physician Choice film, while our flagship Super Rapid films feature high speed and resolution and allow maximum processing flexibility. Also, Konica Minolta DRYPRO dry laser imaging film is available in clear or blue base to enhance any modality image. MGX-SRType MGX-SR is a very high contrast orthochromatic film, suitable for extremities and special procedures, as well as other exams where maximum contrast is desirable. New CM-H film is designed to provide excellent imaging quality while demonstrating processing-friendly quality control characteristics. The peak contrast and latitude of New CM-H enables high quality results and fulfills MQSA film-screen requirements in any orthochromatic mammography screen. The CM Mammography Cassette, MD-100 and MM-150 mammography intensifying screens further enhance and complete the system. Type SR-DUP is a duplicating film designed to provide excellent tonal characteristics. Type SR-DUP film is manufactured with a non-glare matte finish and has 45 second processing capability when using Konica Minolta's Super Rapid System. SR-DUPc is a clear base product. Type C and C-SR are single emulsion, orthochromatic films, designed to reproduce CRT images with high contrast and high resolution. These films incorporate an anti-halation layer to produce maximum detail. Type C (blue base), Type Cc (clear base) and Type C-SR (for super rapid processing) are designed for use in CT, MRI, digital imaging, nuclear medicine and ultrasound. 1.As heat-processed-type film is susceptible to high temperature or strong sunlight even after it’s processed, it should be stored in a cool, dark place. When storing film for a long period of time, be sure to place it in a film bag and store it in a place where temperature is 25℃(77°F) or below. The rise in density or discoloration may occur more frequently as the temperature rises. 2.If the film stored at a temperature of 40℃（104°F）or higher, this may cause density changes or discoloration even over a short period of storage. Avoid leaving the film in a car in daytime, or using it with a hot lamp etc. 3.As the film is susceptible to strong sunlight as well as temperature, avoid exposing it to direct sunlight, or leaving it on a viewing screen for a long time.